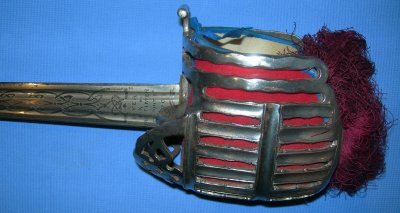 In good condition, this basket hilted broadsword was made for Charles Kennedy, the 5th Marquess of Ailsa. The Marquess of Ailsa is the hereditary Clan Chief of Clan Kennedy. 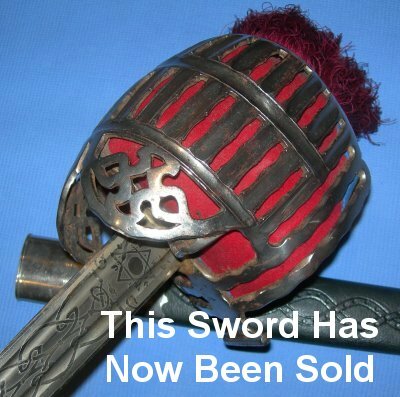 Documented provenance attesting to the fact this sword was made for and owned by Charles Kennedy, the 5th Marquess of Ailsa, former owner of Culzean Castle on the Ayrshire coast. It is believed the sword was made for his marriage (2nd) to Helen Ethel McDouall in 1933 and was also worn at functions thereafter. Charles Kennedy led a full life in England, then Australia, then the USA and finally Scotland. Made in the Stirling style by renowned makers Meyers and Mortimer while they were in Conduit Street London (they were bombed out during the London Blitz / WW2). The long 34 inch blade is also quite broad at 1 1.2 inches at the ricasso; clearly the blade was specially made for the Marquess; etched with symmetrical Celtic patterns and firm in the hilt. The blade has patina areas to the point and small spots hear and there. The hilt with some plating loss spots is generally good. The faux fishskin grip and twisted grip wire bindings all in very good order. 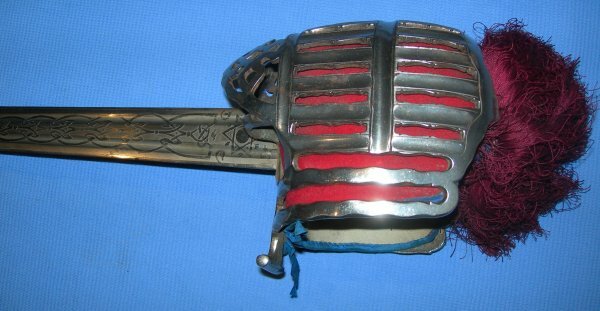 The faux leather and plated metal fittings scabbard, with Celtic symmetric pattern to one side in in very good shape. The sword sheathes and draws well. 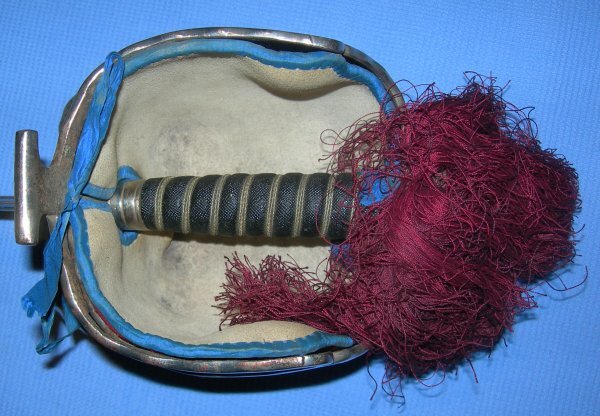 What a great chance to own a superb basket hilt with top provenance. Further / full sized images available upon request. Please quote item reference number C76 (680).